Is a Semi-fermented Tea an Oolong? Obscurantism: What Tea are you Really Buying? What Really is a White Tea? “Raw” Puer or “Cooked” Puer? Is Pu’er Cha Bing an Investment Tool? The original sun-drying for green tea is similar to oolong sun-withering, where the newly plucked leaves are thinly laid on bamboo sieves under the bright sun. This is the same thing that most civilizations have done with their food since before written history: laying down the produce to dry under the sun for preserving to use later. Tea was not any exception. Since prehistory, the Chinese has had an especially strong heritage of the use of dried plant materials and tea began as one of the medicinal herbs. 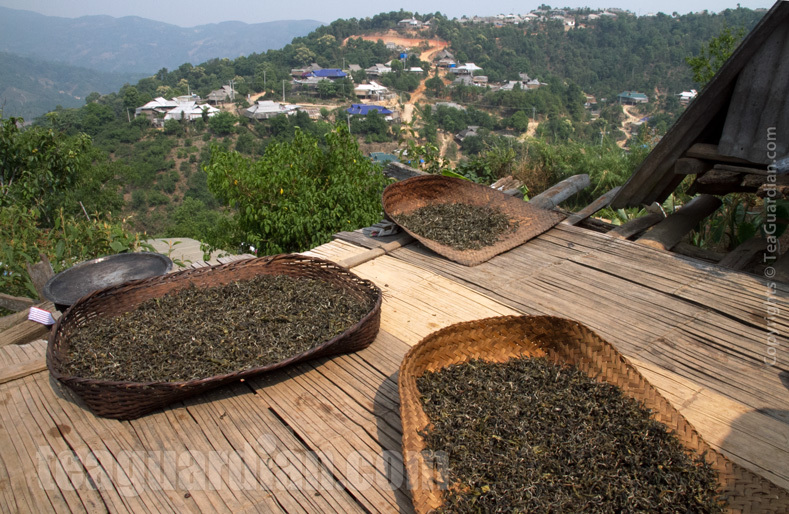 Tea leaves being sunned in a dense and thick layer in maocha production in Yunnan, quite different from sun drying for green tea, where the leaves are laid thinly. Sadly, we are not able to find a producer that still practice the latter, so we have to borrow the sun withering picture from oolong production to illustrate the point at the top of this article. Sun dried premium plucks have a brightness and freshness that are very pleasant and unique. Historically, people praised about the superiority of the quality possible from this approach over that from roasting and baking (note). That quality is possible, however, when the weather is right and the producer is up to the bet — sun-drying for quality productions takes a long time and it has to be under consistently bright sunlight for at least two days or more. I had some very fine ones years ago, but have not been able to find any more producers doing this now. The typical unstable weather in Spring in finer tea regions has not allowed this approach without heavy losses. Most turn to baking and roasting. The one exception maybe productions of crude tea ( maocha ) for further processing, typically shengcha puer and post-fermentation tea production. 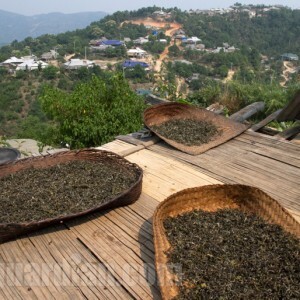 However, unlike the production for traditional finer sun-dried green teas, the tealeaves are laid quite densely under the sun, it is rather like traditional white tea making. That is also why we have categorized shengcha as a white or lightly-oxidized tea. 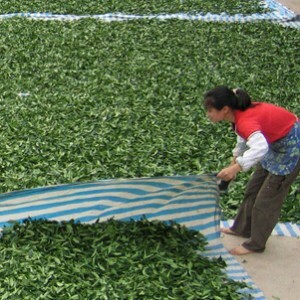 Sun-drying tea in Yunnan for maocha production. Today genuine sun-drying for tea is done only in very small scale for family use. We have yet to find the same for green tea production. Today, sun-drying in Yunnan, where pu’er teas are made, may see the most intense application than anywhere else for tea production. The resultant “crude tea” ( maocha ) is meant to go through either compression for making tea discuses ( or tea “cakes” ) or post-fermentation, or years of “natural post-fermentation” (as the local merchants like to call it, basically it is just leaving the tea in the air). The leaves transform into a different tea category with totally different taste characters. Otherwise, very few quality plucks are put through sun or air drying with the intention of making a fine green tea nowadays. A green tea style that can be carrying unique gastronomic characters (perhaps salutary ones as well) is yet to be revived. What does this tea term actually mean? zachno on Hey! Are you aware of the effects? Leo Kwan on Very dry skin and lips all year long. Gujar on Very dry skin and lips all year long. Shou Cha or Shu Cha? Copyrights © 2010 ~ 2019 TeaGuardian.com. All rights reserved. 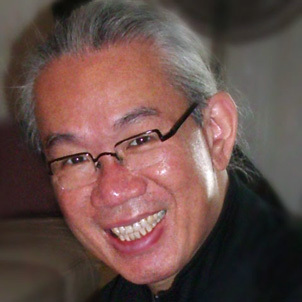 Tea Guardian and the TeaGuardian.com website are founded and operated by Leo Kwan and his team from their base in Hong Kong reaching out to the world. In case you need to contact us, please use this email form or any other form in the contact menu.